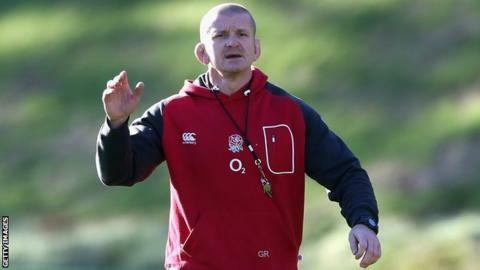 England forwards coach Graham Rowntree says he "doesn't trust" Australia, and is expecting them to have improved in the scrum when the teams meet at Twickenham on Saturday. Under new coach Michael Cheika, the Wallabies have lost against France and to Ireland in Dublin last weekend. "I don't trust them in so far as they always come with something different," Rowntree told BBC Radio 5 live. "They always find a way of covering up that perceived set-piece weakness." And Rowntree feels Australia have made progress under the New South Wales Waratahs boss, despite their setbacks in Paris and Dublin. His predecessor Ewen McKenzie resigned last month after three successive defeats, and former Leinster coach Cheika led the side to narrow victories over the Barbarians and Wales in his first two games. "I have always been a fan of what he brings," Rowntree added. "I think he's brought a robustness about their defence for a start. I thought they were unlucky against Ireland, and that will make them even more fired up for us. "I have got a lot of respect for them. They are a very hard team to analyse. You never quite know what's coming. You have to have your wits about you more than against any other side." Last weekend's 28-9 win over Samoa ended a run of five successive defeats for Stuart Lancaster's England team, but after the losses to New Zealand and South Africa earlier in the month Rowntree is under no illusions about the importance of the match on Saturday. "This is just a massive game for us," the former England prop admitted. "We've not performed as well as we would have liked consistently. They are going to take some beating, but if we hit those performance levels we have been striving for, we will beat them." And Rowntree says the squad is determined to recapture the form of the Six Nations earlier in the year, when England won four games in a row. "We are desperate to get back to those days, and that game we were playing." England will name their starting XV on Thursday, but Rowntree has confirmed there will be changes to the pack that started against the Samoans. "We were always going to have a look at certain people in that Samoa game, but this is Australia," he said. The Northampton pair of Dylan Hartley and Tom Wood are likely to return, with Rob Webber and James Haskell dropping to the bench. Meanwhile Rowntree expects second-row Courtney Lawes to recover from a knee injury to start against the Wallabies. "I'm confident. He's not trained today, but we expect him to train Thursday," Rowntree said. "You have to give these things time to settle down, but chances are he's going to be playing."